Good evening, BB addicts! Shortly after 6pm BBT, the live feeds switched to trivia for the Veto Comp. As soon as they come back, I'll post the winner of the Veto. If Helen wins it, she stays & Elissa will go. If Helen doesn't win it, she goes. **Mobile Feedsters: If you're getting a forbidden error when watching the feeds on your mobile device, then here's the solution: go to the CBS website, scroll down to bottom of page and click on full site link, then go to the live feed link and put your password on again. CBS is aware of this issue & they're working on it. Elissa won Veto, bye-bye Helen. Sounds like it was the Otev comp. HG's including Helen congratulated Elissa on her win. Spencer hurt his leg during the comp. Andy got a little hurt from the comp as well. Helen told Elissa to not gloat about her win because it might rub people the wrong way. GM & Andy had a hard time finding Jeremy's name. Andy hurt his eye because Elissa pushed him and he fell into a log (??). Andy: "That b*tch (E) was a BEAST during the comp!" Amanda: "Elissa FLEW up that ramp!" GM: "She didn't even need the rope!" Andy (to Amanda): "Once Helen was out, I was like (sigh of relief)." Andy: "Helen is happy that Elissa won, she thinks Spencer is gonna go home." Amanda: "It makes sense to keep Spencer here because he will go after Elissa & Elissa will go after him." Spencer/McCrae are talking about the veto comp. Spencer knows he's gonna be the replacement nom & that he's safe this week. Spencer: "She (Elissa) is being a f**king c***. But it's all good, I know I'm safe this week." Amanda/Andy/Aaryn are talking about next week since this week is "already done". 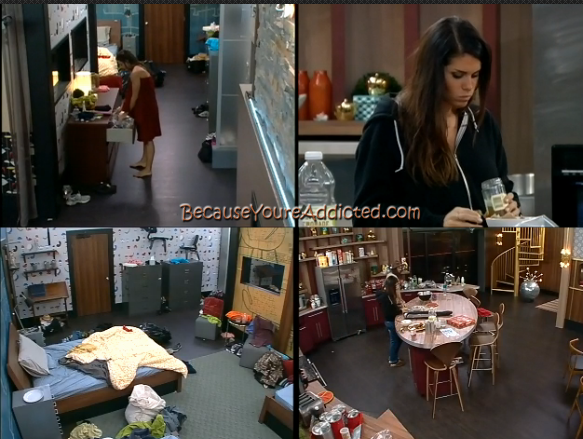 Amanda is saying that Elissa has to go next week. Andy: "Helen was really happy that Elissa won because she thinks she has the votes." Now that Helen is going out, Aaryn wants to confront Helen on all of her lies. Amanda says Helen lies to everyone. Spencer joins the HOH crew. They start talking about the comp. **Okay, I'm outta for the night. 12 hrs at the computer is long enough for one day for this blogging gal. lol :P Turn on the live feeds, the night is young & the game talk is just starting! :D See y'all tomorrow with The Overnighter!! If there still on trivia how do you know Elissa won? Ugh..was hoping Helen wouldn't be goin home this week, cause I have a feeling she's gonna win the jury comp. & get to come bk. Grrr. What happened to elissa wanting to self evict herself?!?!?!? She goes from that to beasting it up /winning veto?!?!?!? She cried and cried about not wanting to be here ...ughhhh! I cannot get a read on elissa to save my life!!! Is this just all a big act or is this her strategy?!?! Remember Helen will compete Thursday to get back in the game. That probably would be best for viewers cuz H/E would go after McRanda and H would know A/A were against her. She'd have to get Spence & GM and they'd have to win HOH but it'd be 4vs4. Second choice would be Judd although he might just get voted out again. Candice & Jessie definitely would be snoozefest UNLESS they got HOH. Yay Elissa you go!!! Win a freaking hoh!!! OMG there's hope for this season yet. Shannon, I don't think it's an act or a strategy. I think Elissa is just self-centered and does what she wants when she wants it. If that means thumbing her nose at the house by winning a comp? She does it. If it means self-evicting because she doesn't want to be there? She'll do it. Everyone though Rachel was a flake. Guess what? Not so much. I'm with you on this. I honestly don't think she is a good actor though. I don't know...I'm stumped.